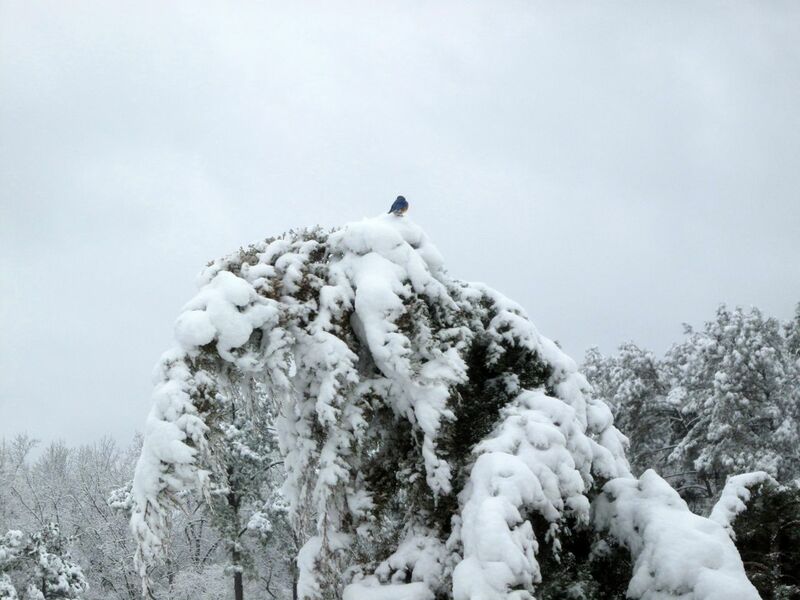 This Eastern Bluebird is perched on the folded tip of the juniper next door. 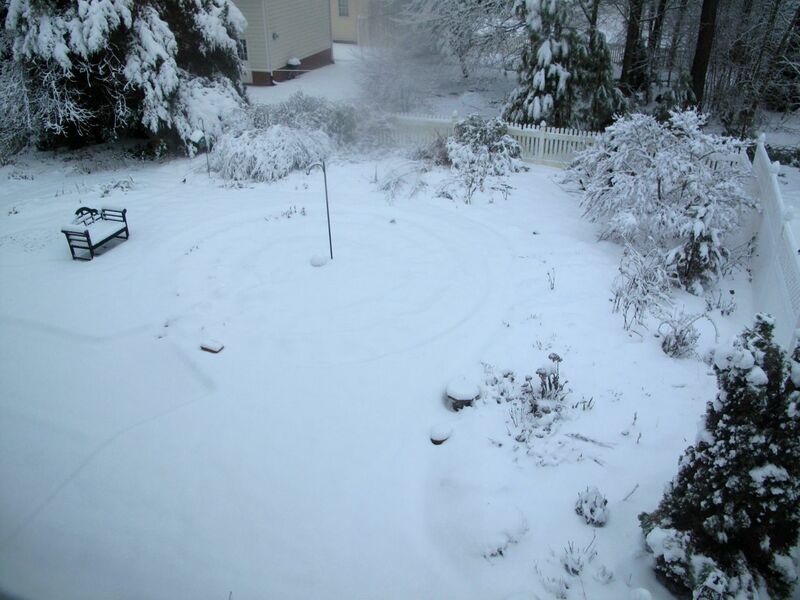 A heavy wet snow overnight transformed the winter garden. Once again the birds are scurrying back and forth between feeders and favorite perches. Surrounded by draping branches of ‘Carolina Sapphire’ Arizona Cypress, a Northern Cardinal waits patiently on a redbud branch while the Eastern Bluebirds take a turn at the feeder. 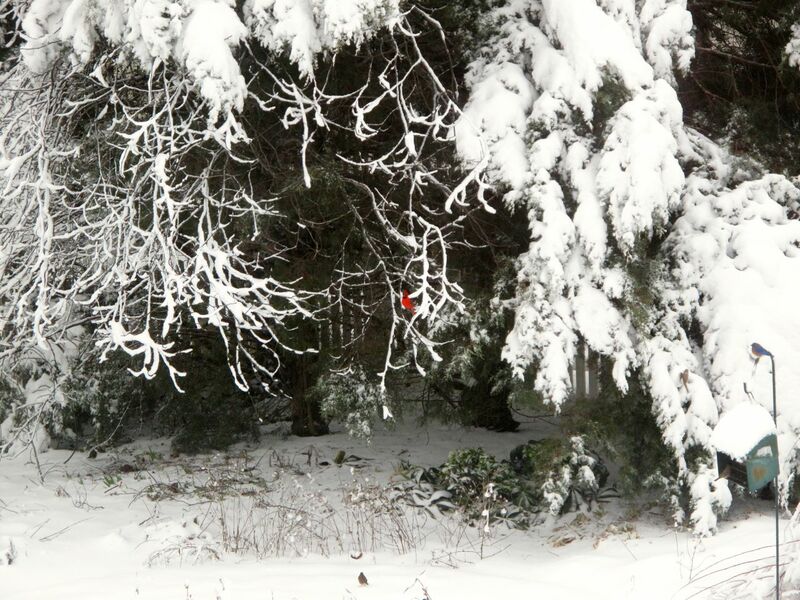 Looking below and to the right of the cardinal, the green clumps on the ground are Hellebores. Here are the same ones seen looking more colorful yesterday. 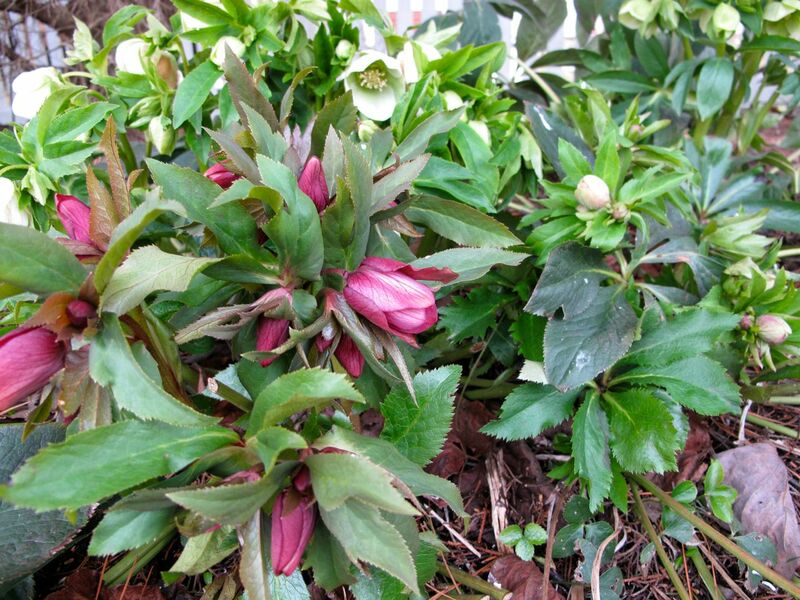 This collection of Hellebores in the garden’s southwest corner were among the last to bloom. Speaking of hellebores, I highly recommend this new video from a well-known, North Carolina-based nursery: Hellebore (Lenten Rose) Production at Plant Delights Nursery. 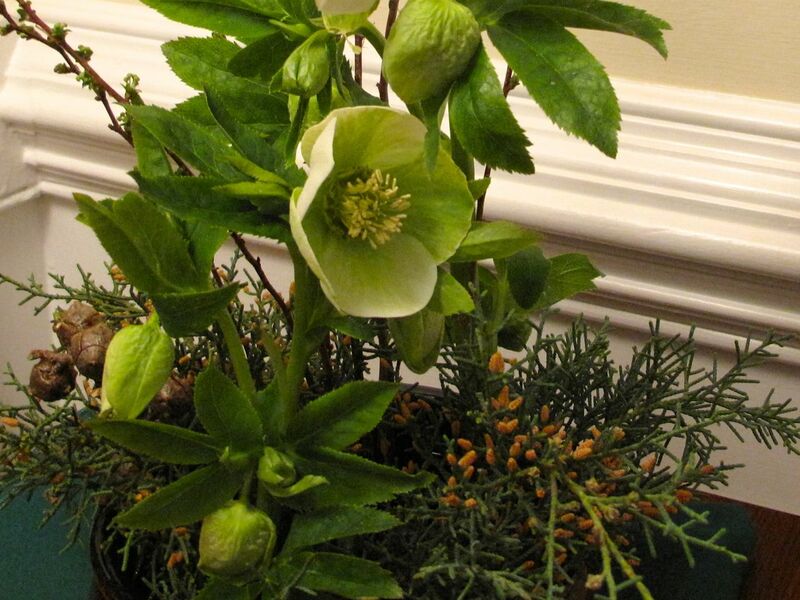 Owner Tony Avent explains how he grows and selects Hellebores to sell at his nursery. 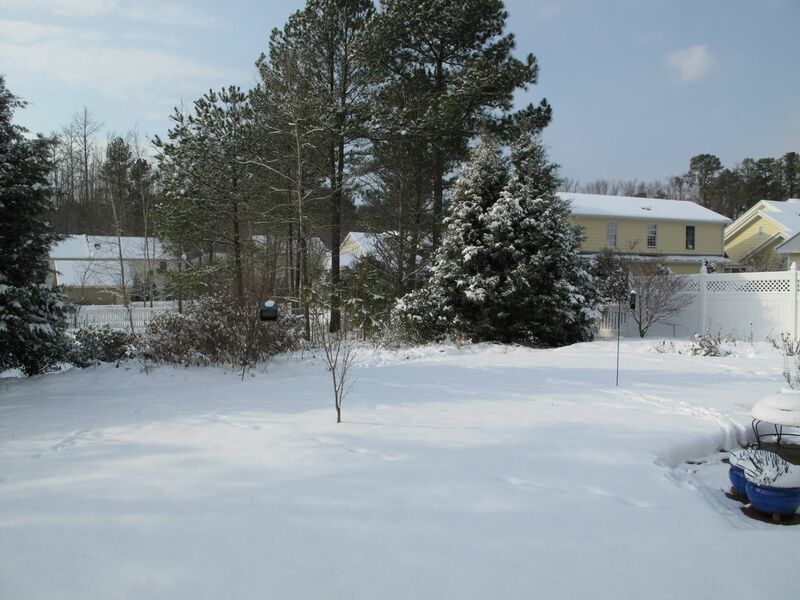 Fortunately with a high forecast of 37 °F today the snow is already beginning to melt, but winter refuses to leave. Low temperatures for the next 3 nights: 26 °F; 18 °F; and 12 °F. There are broken branches in the neighbors’ yards and lots of bent branches and shrubs in the back garden. 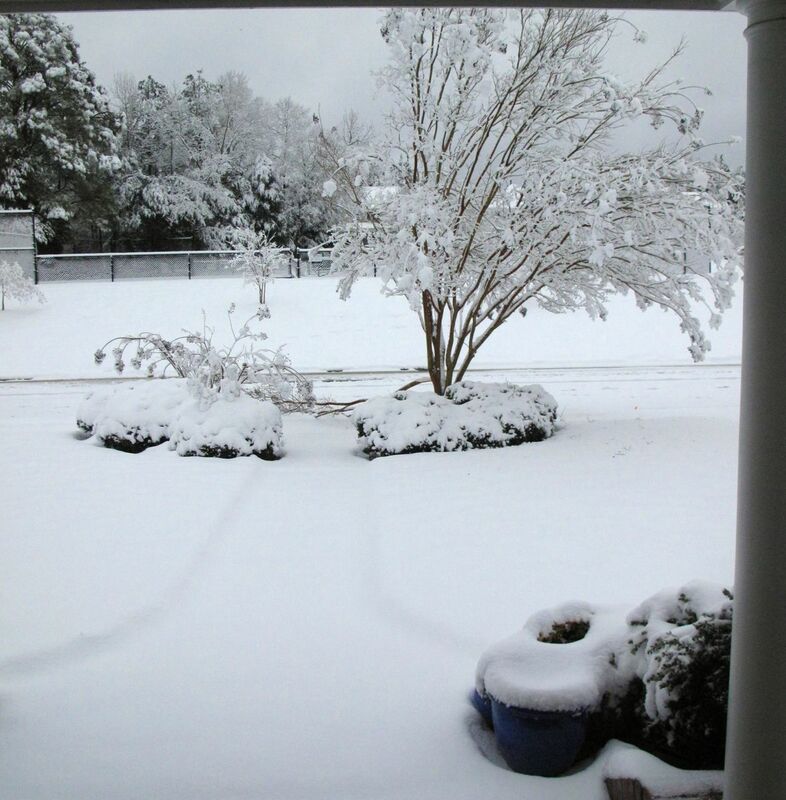 Out front the Crape Myrtle pair have once again been damaged. The crushed one on the left had make such a nice recovery too, after having been flattened by a freakish summer wind shear several years ago. The tree on the right lost a lower branch this time. 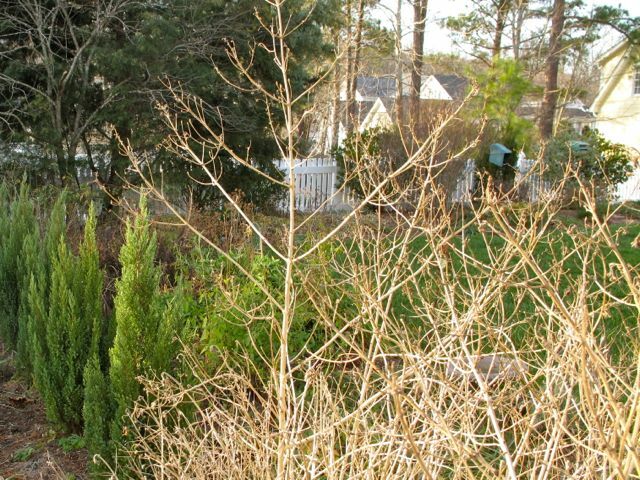 This entry was posted in garden and tagged birds in the garden, Carolina Sapphire, Eastern Bluebird, Helleborus x hybridus (Lenten rose), northern cardinal, winter garden on February 26, 2015 by pbmgarden. In preparation for joining Cathy’s In A Vase On Monday challenge I went out yesterday in late afternoon to see what plants I could rescue. After Sunday’s sunny 71°F. high the forecast for the upcoming week brings a blast of Arctic air with possible snow and ice, and low temperatures near 15° tonight. It turned out there was little to rescue. The long-awaited fragrance of Daphne is beginning to be detectable near the front entrance, but the shrubs still are not in full bloom. Though there is a touch of color on several Camellia japonica buds, the daffodils continue to bide their time. Except for the hellebores the garden has surprisingly little in flower. To hold the plant material for today’s arrangement I used 3 floral pin holders inserted into a shallow, blue and sienna glazed ceramic dish. 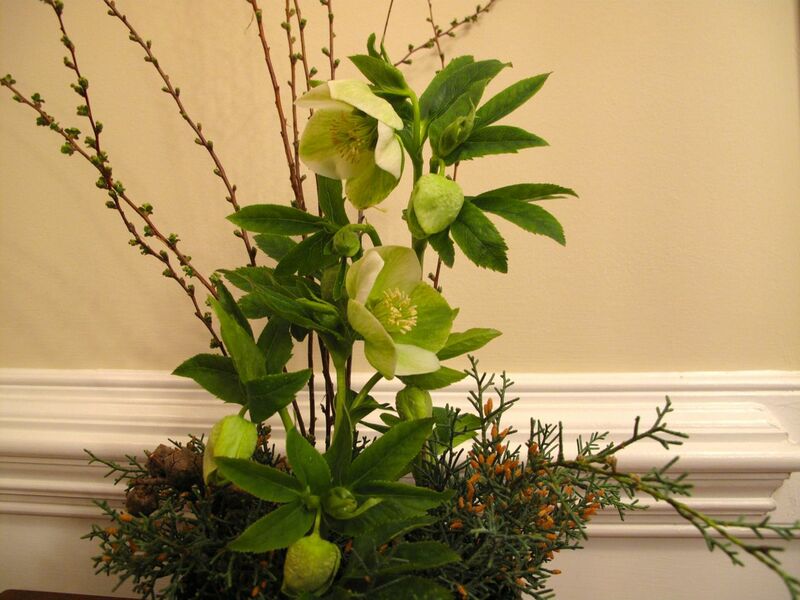 First I added two stalks of Helleborus x hybridus (Lenten rose). 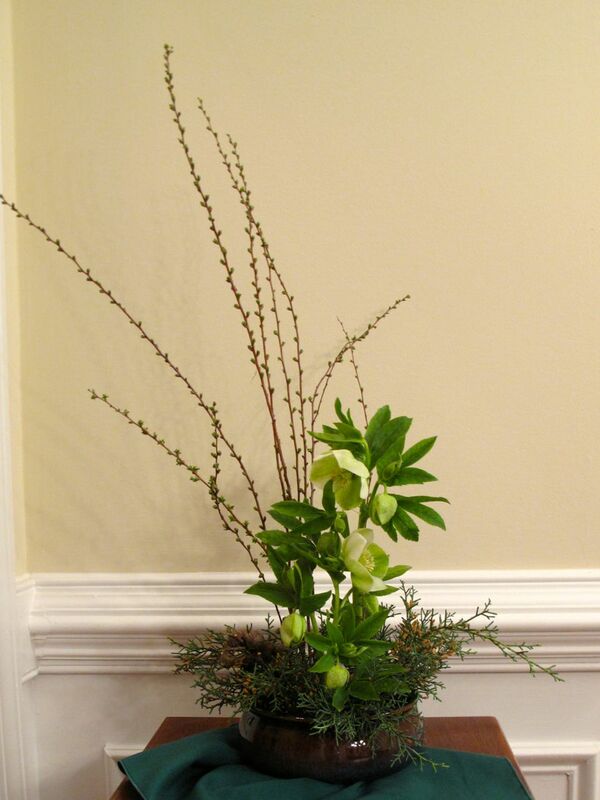 Then I selected some branches of spiraea to add height and airiness in the back of the container. 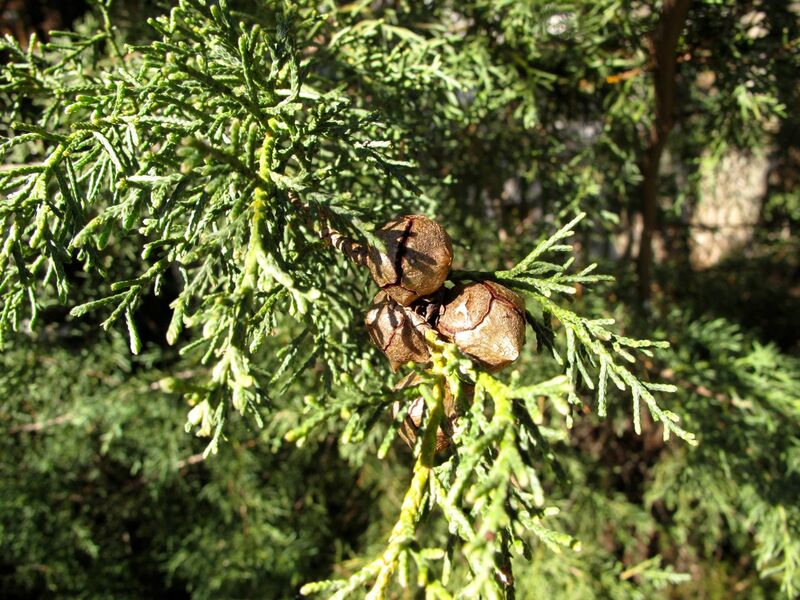 Spherical brown cones and clipped sprigs of greenery from ‘Carolina Sapphire’ Arizona Cypress made a contrasting filler along the baseline of the arrangement. 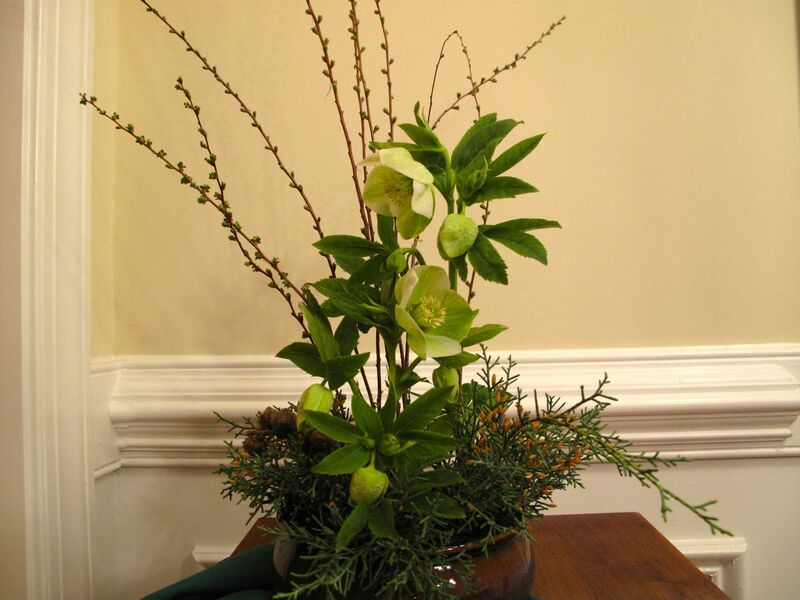 This entry was posted in garden and tagged Carolina Sapphire, flower arranging, flower design, helleborus, in a vase on monday, nature photography, Spiraea on March 3, 2014 by pbmgarden. 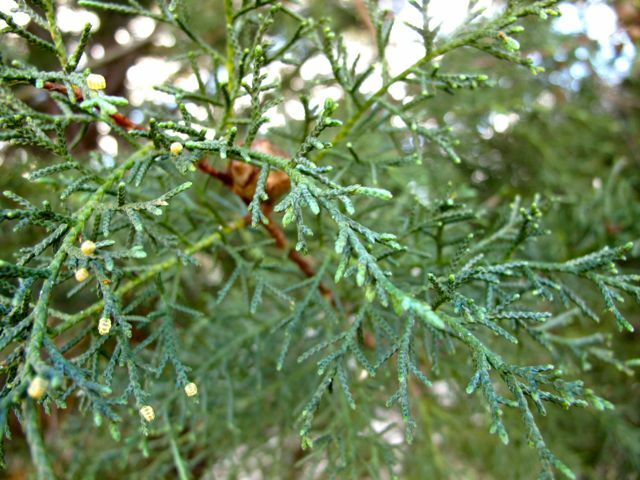 I am partial to evergreen foliage. At the southwest corner of the garden stand a couple of two-story tall ‘Carolina Sapphire’ Arizona Cypresses planted more than a decade ago. 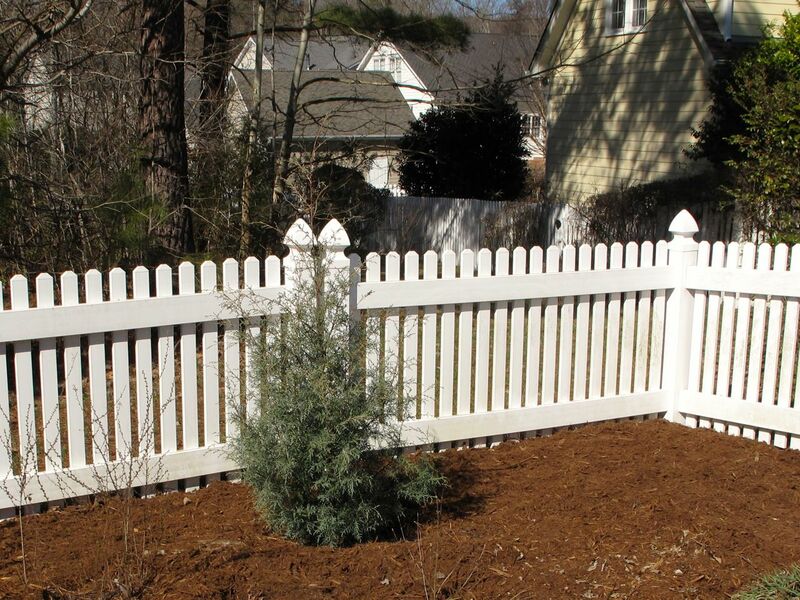 These large evergreen trees are nicely fragrant and give some boundary and privacy to the property. They have the bonus effect of offering a protective home or perch to a variety of birds. The softly textured leaves of this conical-shaped tree are interesting and the one-inch round seed pods are striking. In fall the color of the foliage tends toward blue-green; the seed pods change from silvery to reddish mahogany. These two trees used to have a large sister ‘Carolina Sapphire’ on the opposite corner of the western border. In 2009 it anchored the garden and showed off a rare snowfall, but sadly began to die in 2011 and had to be removed. I think a badly-timed pruning was the problem. Normally these trees are carefree. Today at the northwest corner is a young replacement, trying hard to fill the large void left by its now deceased predecessor. This little one has nearly doubled in size in eleven months, but it will be some time before the balance returns to the border. Last year I filled the space with zinnias. 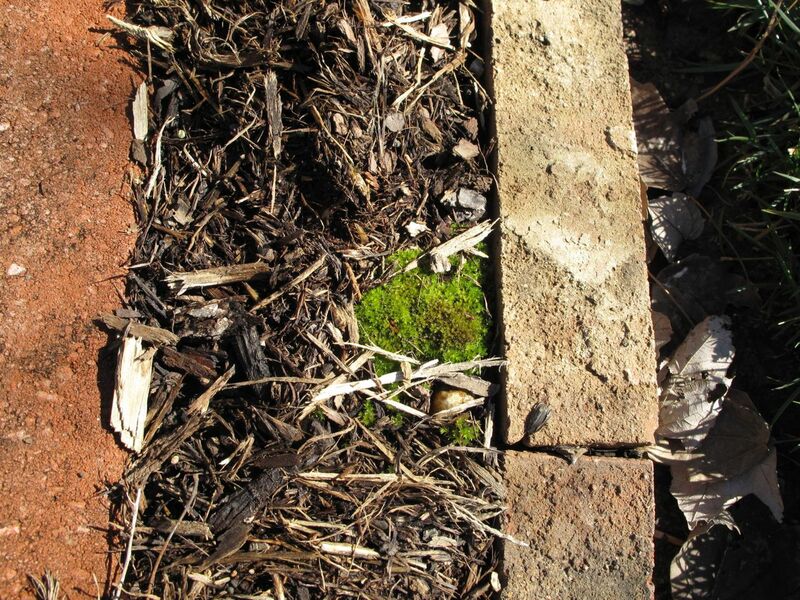 In the meditation circle I have become enamored of the tiny bits of moss showing up between the stepping stones. I dream of winning the lottery so I could bring in Moss & Stone Gardens, whose owners I heard speak last year at a garden club meeting. I would love to cover all the planting areas in the labyrinth with this soft greenness. 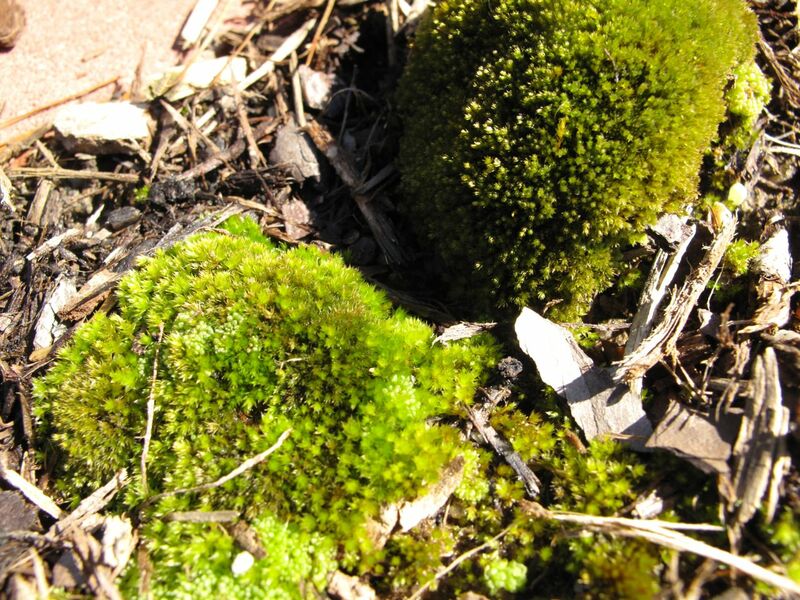 Mosses are drought tolerant once they become established, which can take a year I think. 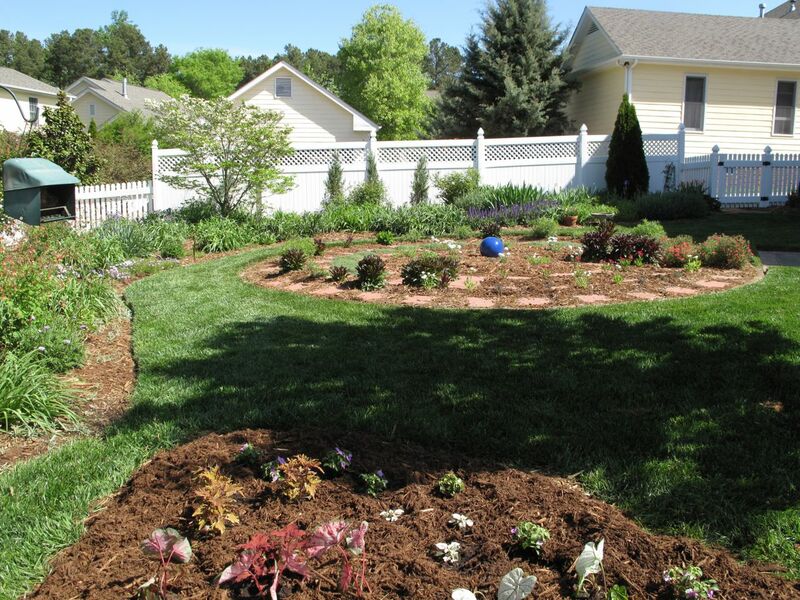 Although I have enjoyed planting colorful flowers here, I would like to eliminate seeing any mulch. 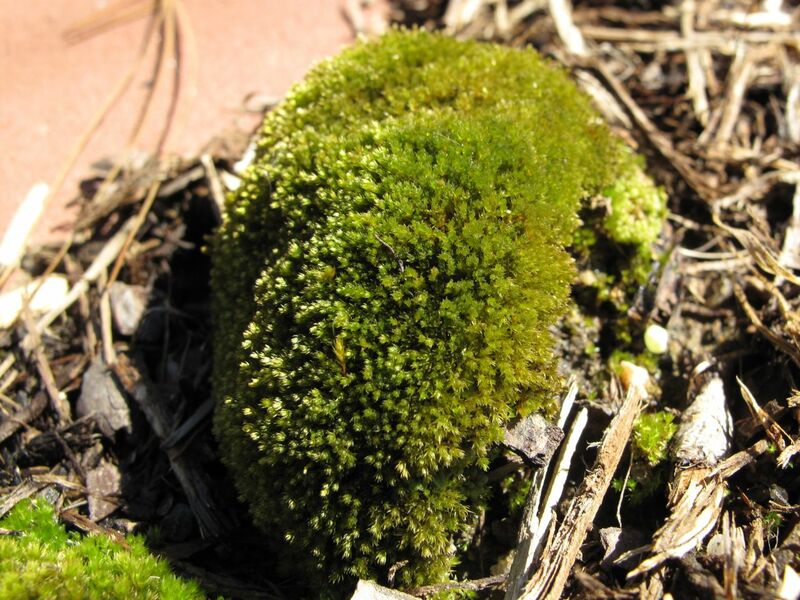 The soft texture of moss seems like an appropriate and appealing choice for this meditative aspect of the garden. 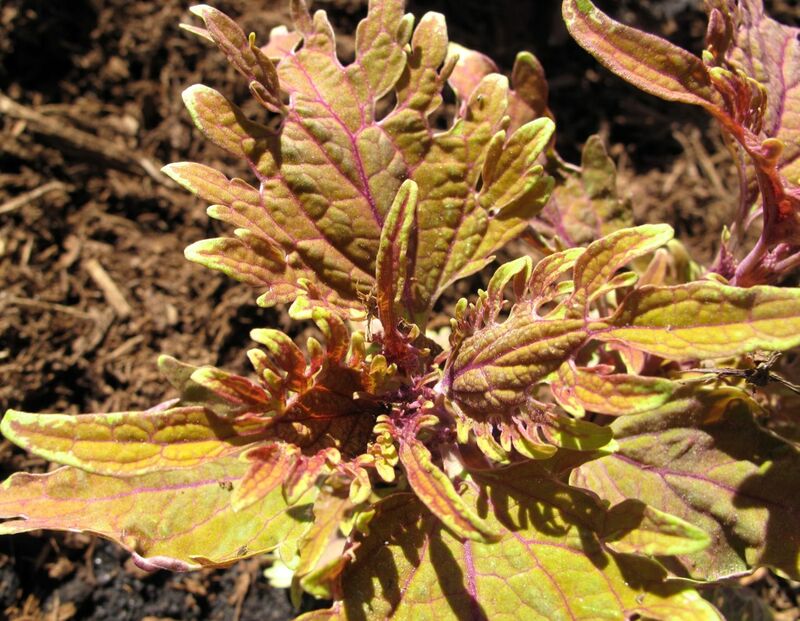 Thanks to Christine at Creating my own garden of the Hesperides for hosting GBFD each month. This entry was posted in garden and tagged Carolina Sapphire, Garden Bloggers Foliage Day, GBFD, labyrinth, meditation circle, meditation garden, moss on February 22, 2013 by pbmgarden. The wintry chill arrived as predicted and today’s afternoon is a sunny, 33 degrees (feels like 25). Near the front walk three bluebirds sit unhurriedly on the edge and sip from the semi-thawed bird bath. 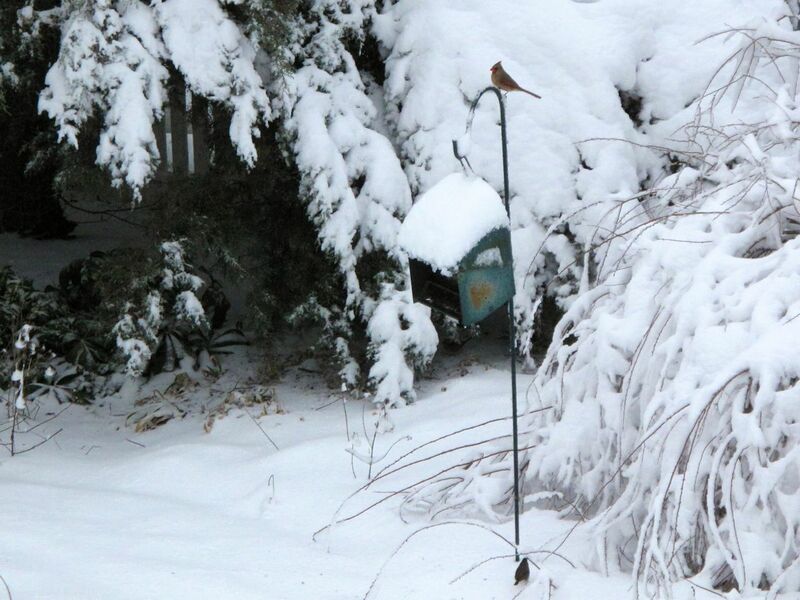 Elsewhere a yellow-bellied sapsucker, numerous cardinals and assorted other friends of the garden vie for openings at the two feeders, while an eastern towhee scratches in the underbrush nearby. With heads bobbing, a graceful pair of mourning doves pushes aside leaves in search for seeds. Camera shy, the birds chide me and warn each other as I walk around the garden. They tuck themselves into the two ‘Carolina Sapphire’ Arizona Cypresses in the back corner or behind the gardenias or spirea until my approach is too much for them. Finally then they flitter off to a nearby, safer spot to observe. Rustling, adjusting themselves, they wait. Back inside, I watch from the glass as these lovely creatures gradually resume their activities and reclaim the garden. 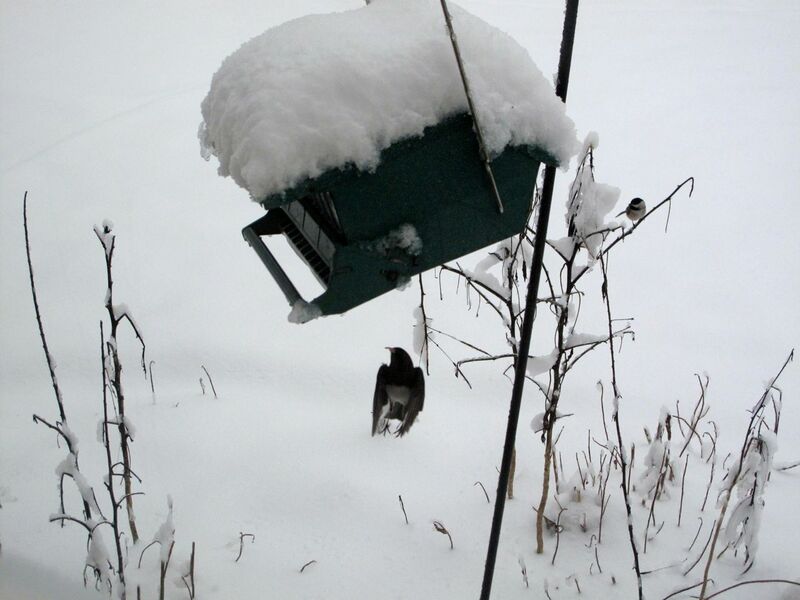 This entry was posted in garden and tagged birds, Carolina Sapphire, winter garden on January 3, 2012 by pbmgarden. 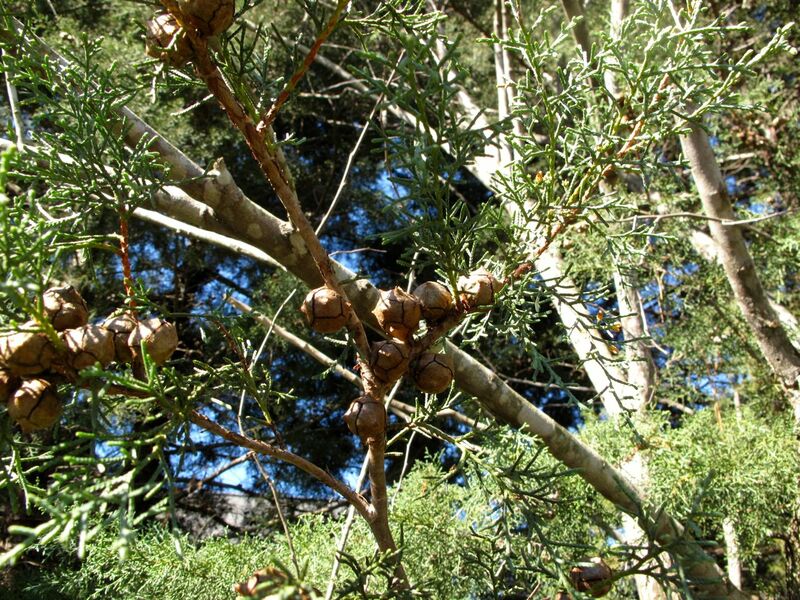 A dying Arizona Cypress “Carolina Sapphire” was removed Tuesday from the northwest corner of the garden where it had grown for almost ten years. 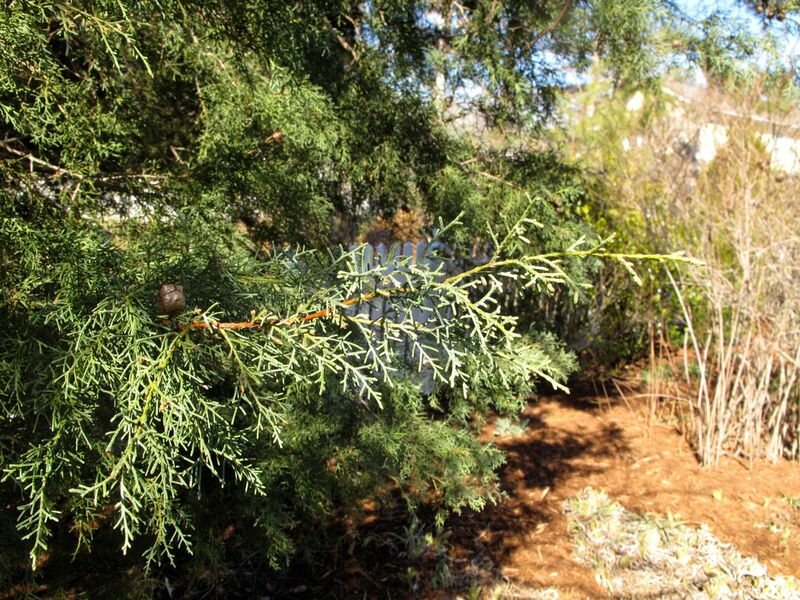 One of three small evergreen trees along the back corners of the property line, this cypress not only anchored the garden and provided privacy, it hosted many of the garden’s birds. The tree succumbed to some aggressive and apparently ill-timed pruning this past Spring when limbs were removed to accommodate the new picket fence. Sap started rushing out from the fresh cuts and soon the tree began browning. 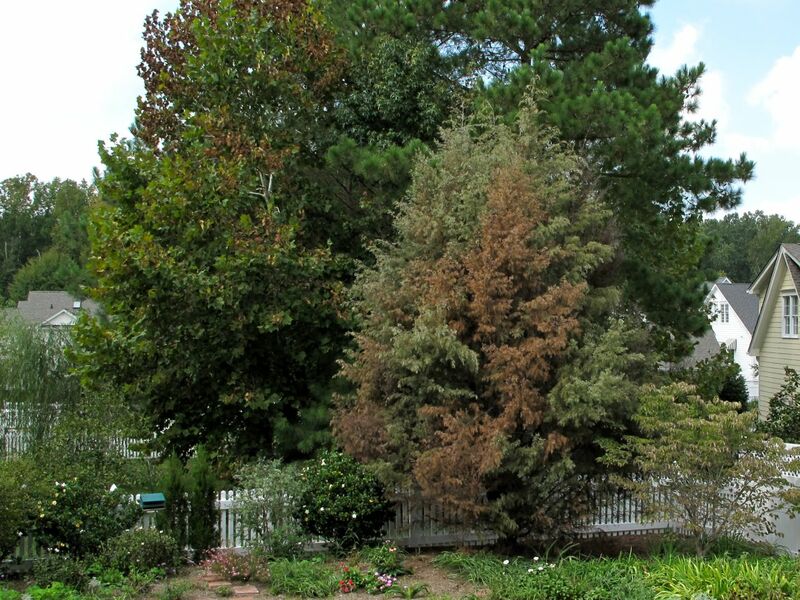 The cypress worsened throughout the summer. Fortunately the two Carolina Sapphires at the southwest corner were unscathed, although they were pruned at the same time. The garden renovation plans begun last winter have been on hold much of the summer. Perhaps finding a replacement for this lost tree will help revive them. 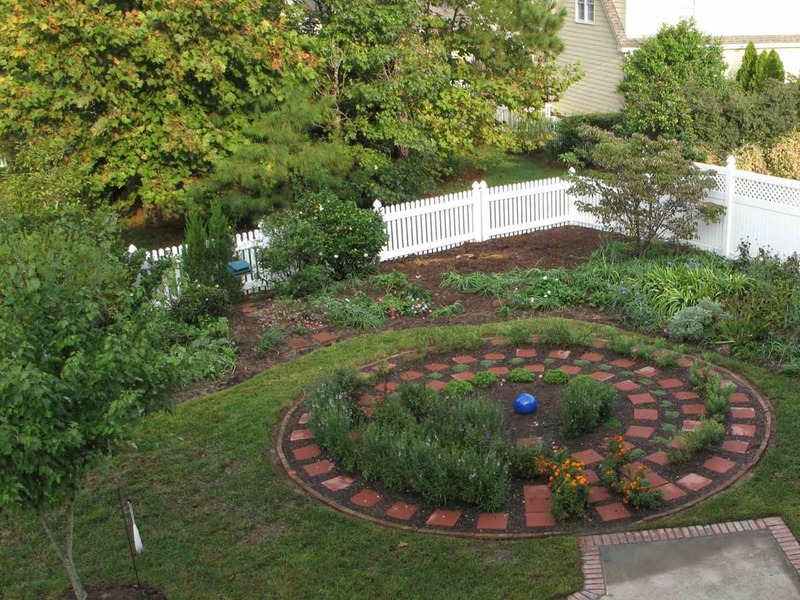 The new fence and the meditation circle were successful additions to the garden and now there is an opportunity to make new decisions about the garden’s structure. Especially in winter this tree will be missed. 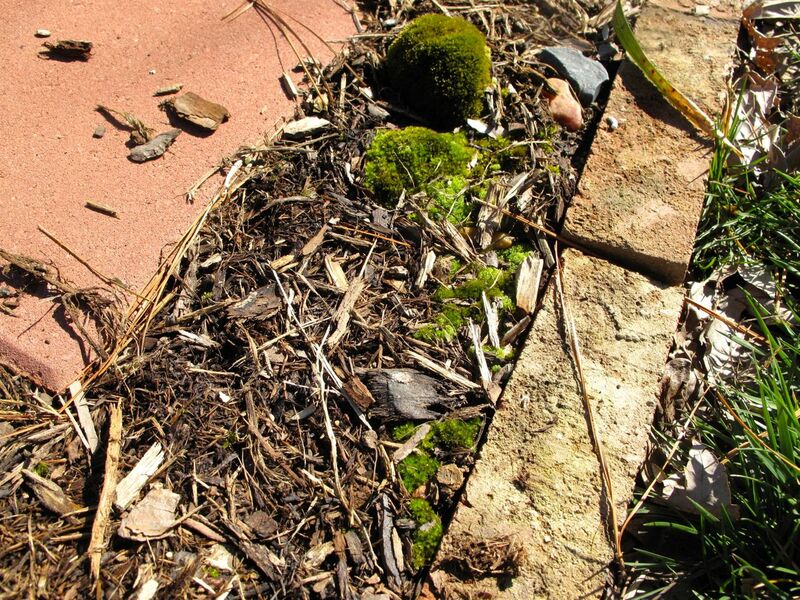 This entry was posted in garden, pbmgarden renovation and tagged Carolina Sapphire, garden renovation on September 29, 2011 by pbmgarden. In-between rain showers, with a deep blue threat approaching from the west, there were a few minutes this afternoon to check out the Eastern Redbud, which began just hinting its color midweek. Nearby the redbud many birds, including a brown thrasher and an eastern towhee, cardinals, house finches, a bluebird, and a mockingbird, have gathered around the feeder today, but they all tucked themselves away as I approached to inspect the dark pink flowers. Clusters of magenta flowers sit along the long, gray branches. 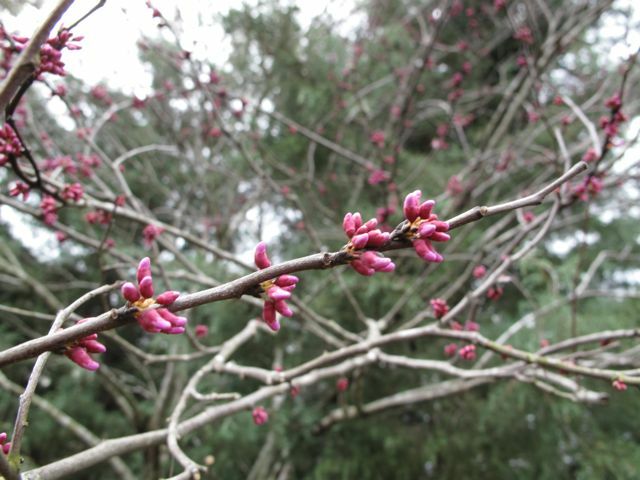 Some flowers emerge from the redbud’s trunk itself. Temporarily “dug in” and never moved, this redbud sits much too close to the Carolina Sapphire (Arizona cypress), but the cypress is a nice background for the redbud’s showy blossoms. 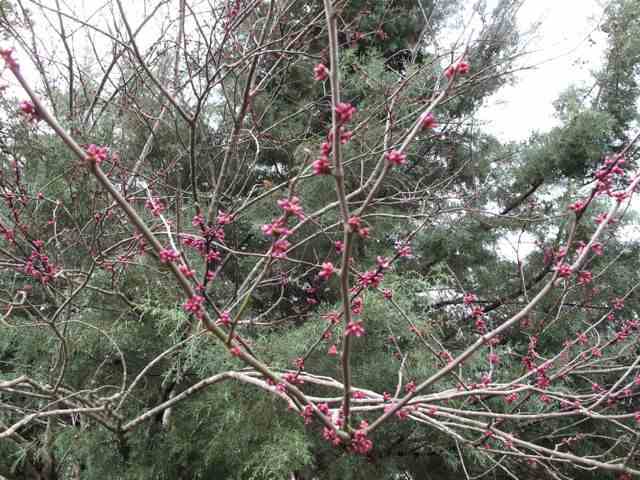 This entry was posted in garden and tagged birds in the garden, Carolina Sapphire, Eastern Redbud on March 6, 2011 by pbmgarden.